Halloween is fun holiday filled with costumes, parties and TONS of junk! I want my kids to have as much fun as all of the other kids, but the amount of candy involved in this holiday makes me a little crazy! So last year I decided to try a little experiment….can a healthy halloween still be happy? My friends thought I was a bit nuts, but to everyone’s surprise the kids LOVED all of the healthy changes. We started the day off with a Halloween party at my house before heading out to go trick-or-treating. The kids were all coming over right from school, so I put out some delicious, healthy snacks (that were also quite cute, if I do say so myself!). We had jack-o-lantern clementines with cucumber stems. 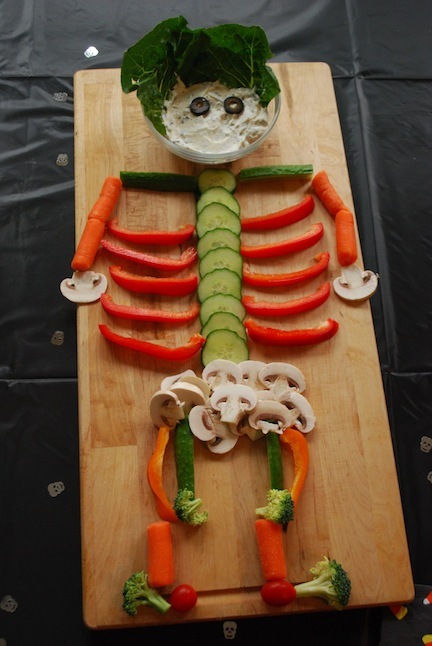 And a scary skeleton made out of veggies with creamy hummus for dipping. The kids loved everything and were well fueled for a night of trick-or-treating. The next step for a healthy Halloween was changing the treats I handed out. I mean, how can I complain that my kids are collecting SO MUCH candy and then turn around and give out more candy? I decided to stock up on a few fun prizes (and just a few sweet treats). I had glow sticks for all of the kids at the party…both fun and practical! And gave out mini containers of play doh (with a few organic lollypops thrown into the mix) to the tick-or-treaters. My friends really though I was going a bit overboard giving out play doh instead of candy, but they all admitted later that is was a fabulous idea. The kid were collecting so much candy, that the play doh was a welcome change. In fact the play doh was such a big hit that I think this year many of then are looking into giving out fun toys as well. You could do play doh, stickers, crazy teeth, tattoos, etc. Even with all the healthy changes, my kids still collected quite a lot of candy. I let them each pick out 3 of their favorite treats and then we started a new Halloween traditions…the Switch Witch. The Switch Witch is a good Halloween witch who loves to trade candy for toys. Simply leave your bag of candy on the front porch (the kids would have been a bit scared if I told them she was coming into the house!) with a note and she will swap your candy for a prize. My kids LOVED it. We are definitely going to do that again this year (I just have to remember to find out what they want the Switch Witch to bring before HAlloween so I can give her the heads up!). The experiment worked. Halloween can be made a bit healthier AND still be happy and fun for everyone!